vegetarian | Grow. Cook. Read. Write. One of the (very few) downsides to my current living arrangement is that I miss my husband. He’s four and a half hours and three states away, which means that visits can sometimes be widely spaced. We had a great run between Christmas and the last week of February, with events conspiring so that we had no more than five days passing between times together. That’s at an end now, and it will have been a week and a half since I’ve seen him when he arrives for the weekend. It will be another week and a half before I see him after that. (But then we’re going to London(!) together for ten days, which seems to make the time seem more bearable.) I have a deep respect for couples that do this separation thing for much longer than we do; it’s not easy. There is, however, an upside to our separation. I can sum it up in one word. I, of course, love the stuff. But marriage is often about compromise, right? So I don’t use cilantro in many recipes, substituting mint and/or parsley and/or basil, depending on what I’m making. And it turns out that I miss it (kind of like my husband, funnily enough). It adds a brightness (Larry would say “soapiness”) to dishes that no other herb can truly approximate. I’ve watched bunch after bunch turn to green slime in the refrigerator when I’ve bought it thinking, “Well, I’ll just use it on a lot of what I eat, and leave it out of his portion,” but wind up just not being able to use it fast enough. That is all at an end right now! I can add it to whatever I want, because I’m only cooking for myself these days. This week, it will be showing up a lot. I was not…shall we say…especially healthy this winter. It has been so cold for so long, and the snow so oddly heaped and mounded and wind-blown, that being outside walking has been downright unpleasant. Instead, I’ve been inside pretending that cheese is a balanced diet. The end result: it’s a good thing I own a lot of sweatpants. I need to get back on track, and at the same time, I’m using this opportunity to test recipes for the personal chef business I’m working on setting up. More about that later, hopefully. This week, I’m testing vegetarian menus, and most of what I’ve chosen comes from Ottolenghi’s book Plenty. I think I’ve said it before, but it bears repeating: the man is a genius. His ingredient lists are often long, but they’re usually made up of dried spices that simply need to be measured out. The Spicy Moroccan Carrot Salad and the Freekeh Pilaf that I had tonight only took about 45 minutes, because some of the chopping was duplicated in both recipes, and while things were working on the stove, I could be moving ahead elsewhere. Read through the recipes before you make them, so you can figure out whether or not you need to have all of your slicing and dicing done in advance, or if there’s “down-time” in the recipe when you can be working on that while the stove or oven does its thing. Here’s what is so brilliant about both of these recipes: there’s no meat at all, but these two dishes are so deeply savory that it didn’t matter. The grains in the pilaf are chewy, so you have to work your jaw like you would with meat, and the allspice and cinnamon are nothing like pumpkin pie spice. The jalapeno-heat from the carrot salad blended beautifully with the garlicky yogurt topping on the pilaf, and every bite of each just kind of jumped (flavor-wise–no moving parts in the recipes!) in my mouth. The leftovers are for lunch tomorrow, and I’m very much looking forward to them! Place onions, butter, and olive oil in a large heavy pot and saute on a medium heat, stirring occasionally, for 15-20 minutes, or until the onion is soft and brown. Meanwhile, soak the freekeh in cold water for 5 minutes. 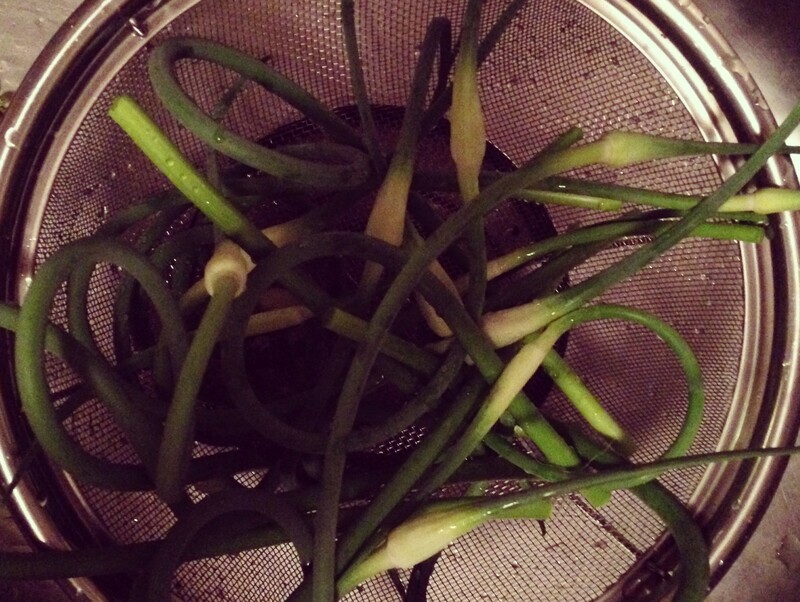 Drain in a sieve, rinse well under cold water, and rain well. Add the freekeh and spices to the onions, followed by the stock and some salt and pepper. Stir well. Bring to the boil, then cover, reduce the heat to a bare minimum, and leave to simmer for 15 minutes. Remove the pan from the heat and leave it covered for five minutes. Finally, remove the lid and leave the pilaf to cool down a little, another five minutes. Stir the herbs into the warm pilaf. Taste and adjust seasoning. Spoon onto serving dishes and top each portion with a generous dollop of the yogurt mixture. Sprinkle with the pine nuts (I jumped the gun and mixed them into the pilaf–no damage done.) and parsley and finish with a drizzle of olive oil. 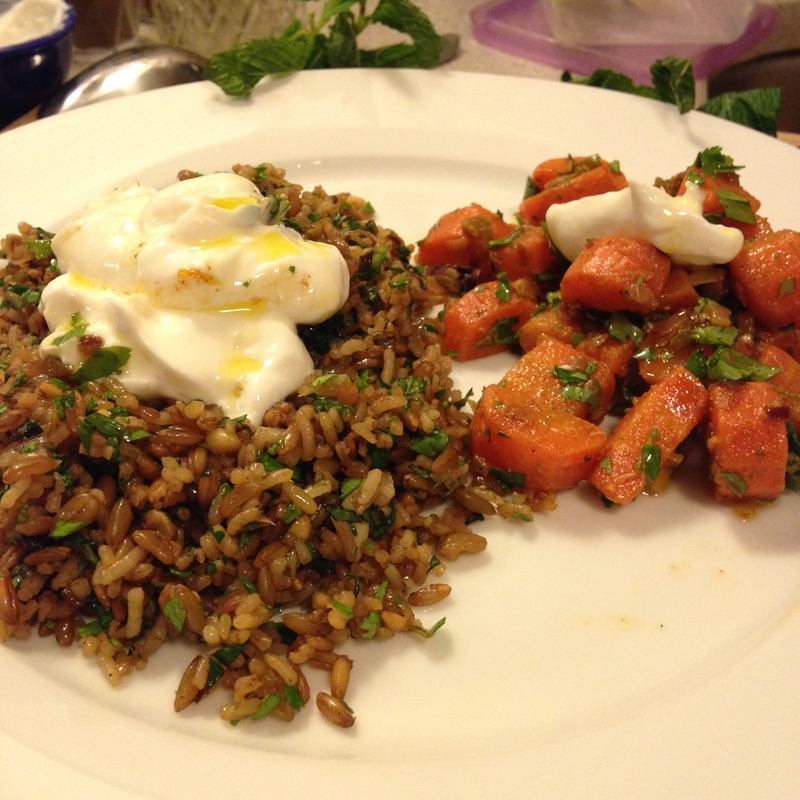 This entry was posted in Cooking, Life and tagged balance, cilantro, freekeh, fresh herbs, Ottolenghi, vegetarian on March 3, 2015 by titang0415.